Companies, creators, and groups have long used free prizes to draw the attention of the public, and now Amazon wants to turn it to their advantage. 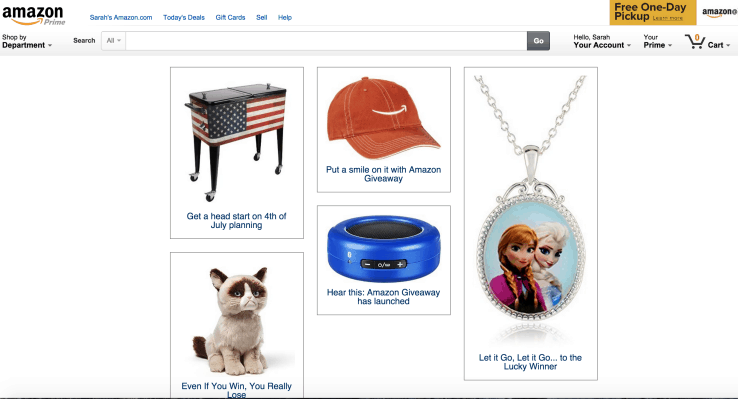 The retailer launched a new giveaway service on Tuesday which looks to simplify and automate the process of running a promotional contest online. Anyone who has an account with Amazon can launch a giveaway contest and offer contestants just about any prize they want - just so long as it's carried in Amazon's warehouses. The contests can be set up so the first X participants get the prize, or every Xth participant receives one, thus guaranteeing either a frenzy or a long term build to a finale. The costs of the prizes (as well as shipping and taxes) will have to be paid in advance, but Amazon assures us that any unawarded prizes will refunded and the costs reimbursed. To get the ball rolling, Amazon is offering a few contests of their own. The first can be entered simply by clicking on the icon, but to enter the other two you will need to follow Amazon on Twitter and let Amazon's Twitter app have access to your twitter account. I can't speak for you, but that is a turn off for me. While this looks like a useful service which could make a lot of practical sense, I noticed that there are a couple obvious improvements Amazon could make. I've looked over the Amazon Giveaway FAQ carefully and browsed the site, and I can't find any way for someone to launch a contest and give away an ebook or other digital content. I would have though digital content would be the ideal prize. The production and distribution cost for even a large number of prizes is minimal, and Amazon could turn the contest to their advantage by suggesting that the winning contestants add the music or ebook to their Amazon account. Unfortunately, Amazon doesn't even let you give away an ebook which is in the Kindle Store (nor Kindles), so that idea is out. And that a shame, because I would bet that publishers would like the chance to give away a limited number of copies of their more expensive books - or at least the chance to test the idea. If nothing else, it would make a change from simply putting the ebook on sale. Well, it looks like it’s available for CreateSpace books, but it doesn’t strike me as a good idea for authors. For one thing, you would have to pay for each book at the retail price, whereas, an author can buy CreateSpace books in bulk much cheaper on CreateSpace. Plus, if you run your own giveaway, you end up with your reader’s name, address and email info. And, you can sign the book before you send it. All you save is a trip to the post office. I don’t think this is aimed at booksellers. I don’t entirely understand how it’s advertized/promoted on Amazon, either. Or is it entirely up to the “host” to advertize? I think the host has to do all of the promotion on their own. And you’re right; it’s not a good deal for Createspace titles.